Coming into this rich and talented and historically well-coached Premier League season, no one had any real idea about who was good and who was bad and who would win (probably Manchester City). Then the season started and everyone kind of sucked but in a fun way. Two months in, the teams have started to gel into a closer approximation of what they will be at their best, and we have a few more answers to our questions—there are a whole hell of a lot of really good teams, thankfully only a handful of really bad ones, and that it’ll be almost impossible to feel confident about a top four until the very end, let alone who will win (again, probably be Manchester City). What has unquestionably proven accurate is that this season is crazy good. That’s the top five teams, all separated by a single point, and with almost identical goal differences to boot. Nobody is going to run away with this thing. This weekend’s results were a good example. Only two teams in that top five won their most recent match, and three teams below Tottenham that round out the Good Teams of the Premier League (Everton, Manchester United, Southampton) also failed to win. The games themselves bore out the league’s competitiveness. Coming into the weekend, it felt like Man City and Arsenal were the class of the league, a tick or two more talented and/or better managed than the three or four teams in the same pack. But then Manchester City had to settle for a draw after a fascinating tactical chess match against Southampton, one of the surprise performers of the season; Arsenal were lucky to come away with a draw against a superior Middlesbrough; and the impressive wins of Liverpool and especially Chelsea made it clear that those two squads—plus last year’s best team, Tottenham, who have only gotten better—are more than capable of making serious title pushes of their own. 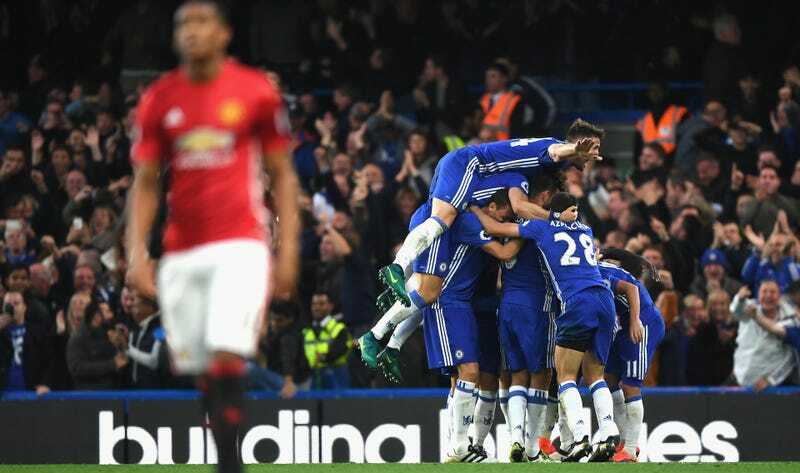 The headliners this weekend were undeniably Chelsea, who welcomed Manchester United and their old manager José Mourinho into Stamford Bridge and summarily decimated them. After last year’s disaster and a slow and uneven start to the new year under Mourinho’s full-time replacement Antonio Conte, it appeared that the Blues were going to be at least a year away from seriously challenging for the title. However, Conte has abandoned his early 4-2-3-1 and 4-3-3 formation experiments, which didn’t get the best out of his midfield and defense, and implemented his preferred 3-4-3 to spectacular results. In this formation, N’Golo Kanté is free to do what he did so well for Leicester’s title-winning campaign last year. He’s tasked with running down every loose ball, charging at every opponent in possession, winning the ball for his team and quickly getting it to the attackers without the more disciplined positional and passing responsibilities that didn’t come naturally to him as the deepest midfielder in Conte’s other formations. The setup also gets Chelsea’s best player, Eden Hazard, closer to goal and allows him freedom to run and drift and create and shoot wherever instinct takes him. This version looks more like the world-class Hazard of two seasons ago and less like that weird, Hazard-looking-thing Chelsea put onto the field most of last year. The attack is creating goals, the defense is preventing them, and the midfield is helping in both directions. This re-energized Chelsea team might not have as many flashy names as Man City and Arsenal, but the team as currently constituted and organized—especially in light of their lack of European commitments—has to feel good about their chances of finishing the year right there around the top of the table. The other team that cemented themselves as honest-to-goodness title challengers are Liverpool. The Pool Boys, famously the favored team of my caps lock-addicted colleague Drew Magary, ran all over West Brom in the same way they have been running over teams all year: battering everyone with their pressing, sending basically the entire team into the penalty box when they do get the ball, and bashing the thing at the opposing goalkeeper as many times as possible in 90 minutes. This, it should be made clear, is not a ragtag band of overachievers being led to a spot above their station by a great manager. Yes, Jürgen Klopp is second to none. But Roberto Firmino, Jordan Henderson, Sadio Mané, Nathaniel Clyne, Adam Lallana, and Dejan Lovren are among the absolute best at their respective positions in the entire league. As with Chelsea, Liverpool’s freedom from Champions or Europa League play should do wonders for their EPL cohesion, form, and health. At this point, it would not be much of a surprise at all if the Reds realize the dream they came so close a couple years ago (in very similar circumstances, mind you), and win the league. This weekend Chelsea and Liverpool—with big helping hands from Man City and Arsenal—erased any notion that the 2016-17 season might devolve into an early two-horse race. No team can be considered big favorites over any other in that tightly contested top five—and unlike last season, it’s not because they’re all kind of bad. No team can take even a top-four finish for granted, and because of how deep the league is, there are very games where three points can be assumed. (Well, except maybe against Hull and Sunderland.) We’re in a state of almost total uncertainty, and it’s a great place to be.